I have always felt that the key to running a marathon was facing your inner demons and coming out stronger on the other side. I truly feel that each marathon I have run has changed me forever. My first made me more sentimental and soft, my second (but first I had run alone) brought me inner strength, my third made me a better friend, and the fourth helped me realize that I can do anything I put my mind too! Today will be a historic day for running, this crazy sport that so many of us love. Whether it be 3 miles on the treadmill or an 18 mile long run, the beauty of the world can be found on a run. Today many runners and supporters will face their inner demons in a whole different way as they head out to the Boston Marathon. It has been a long year of healing for many. Healing from loss, from pain, from a tragic event that they were all too close to. 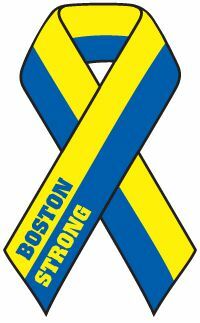 It was an event that hit runners to our core...there is not a runner (or a runner's family) I know that was not affected by the events of last year's Boston Marathon. The images, the thoughts, the sounds...they will forever be embedded in our minds. But today we prove that runners are strong and marathoners the strongest of us all! Today elites, 2014 qualifiers, 2013 runners who had their opportunity taken away from them and charity runners will come together as one to show the world that you can not defeat the human spirit!